My beloved mother is of rather a contradictory nature. 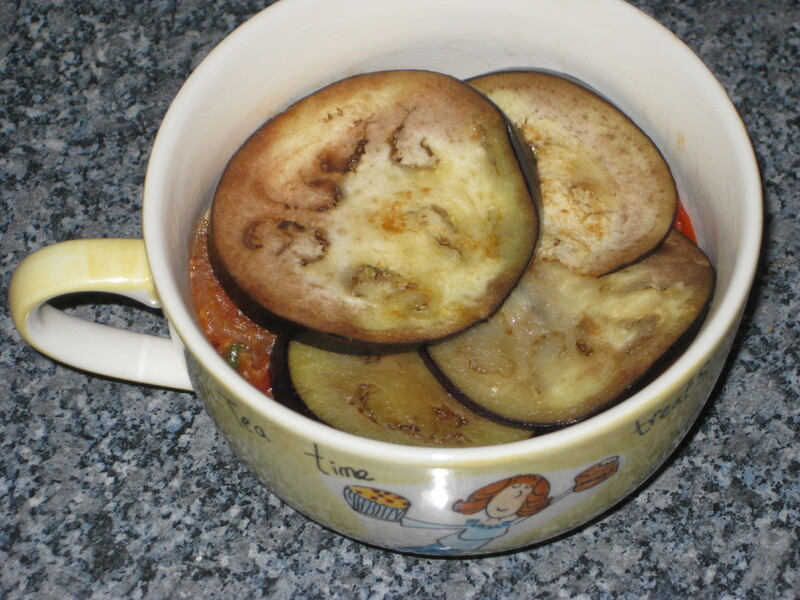 She hates aubergine, yet this is one of her favourite dishes. Maybe she’s not contradictory so much as foolish: this is a woman who said in December “I’m going to buy a chicken because I really fancy some turkey sandwiches”. Indeed. However silly she is, she is quite right to approve of this meal. 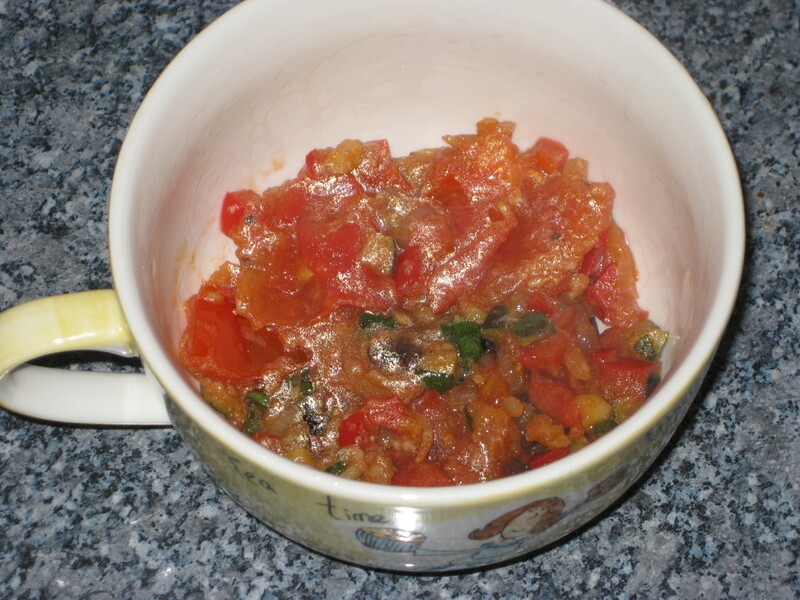 A few years ago I was home for the summer between jobs and rather than succumbing to bone idleness, I set myself the challenge of cooking a new recipe every day. This was the most challenging thing I’d ever made at the time. The mere mention of Gordon Ramsay terrified me, and the pictures of such a prettily presented dish looked miles out of my league. Imagine my astonishment, then, when mine turned out just like the pictures. 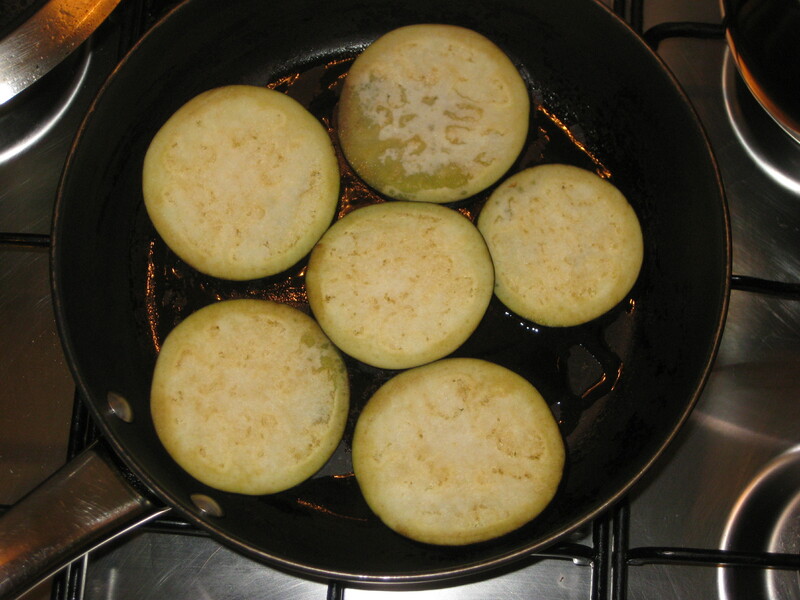 It was a great achievement, and a dish that my mother occasionally requests for special occasions, and as Mother’s Day is fast approaching, it seems like the ideal moment to share it. Be bold – it really is surprisingly simple to make. 1. 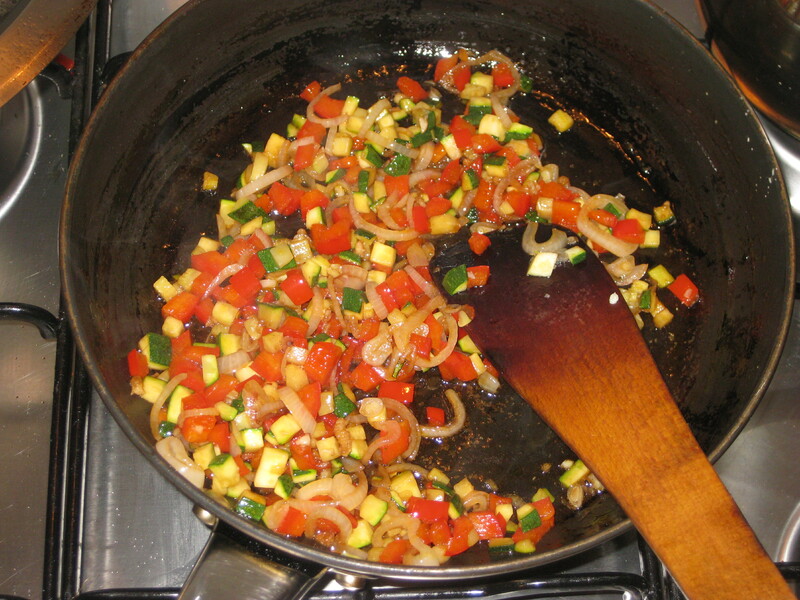 Pour in enough oil to cover the base of a large frying pan. 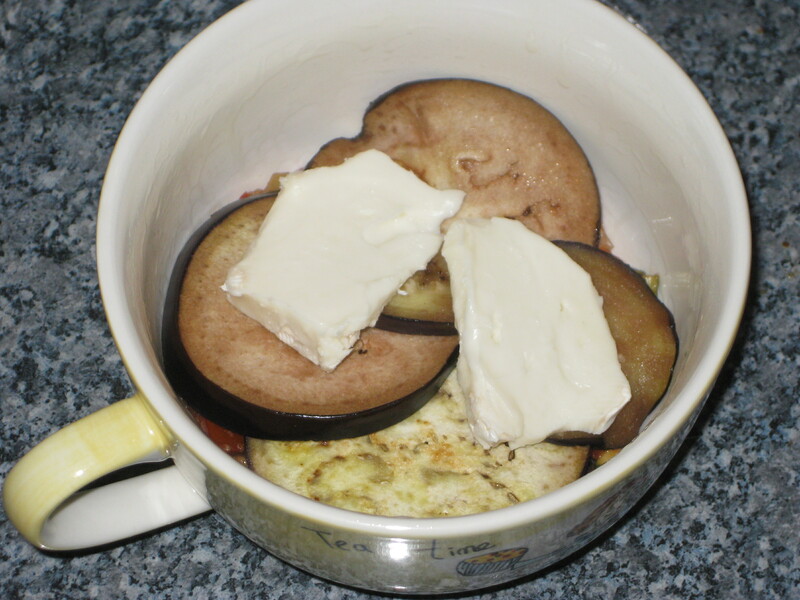 Fry the aubergine slices for 2-3 minutes until softened. 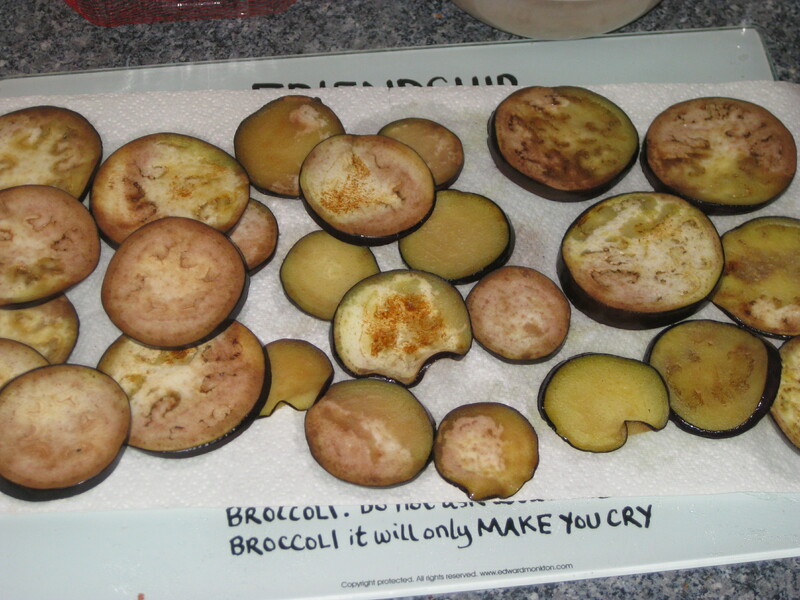 Season, then drain on paper towels – this will probably need to be done in batches. 2. 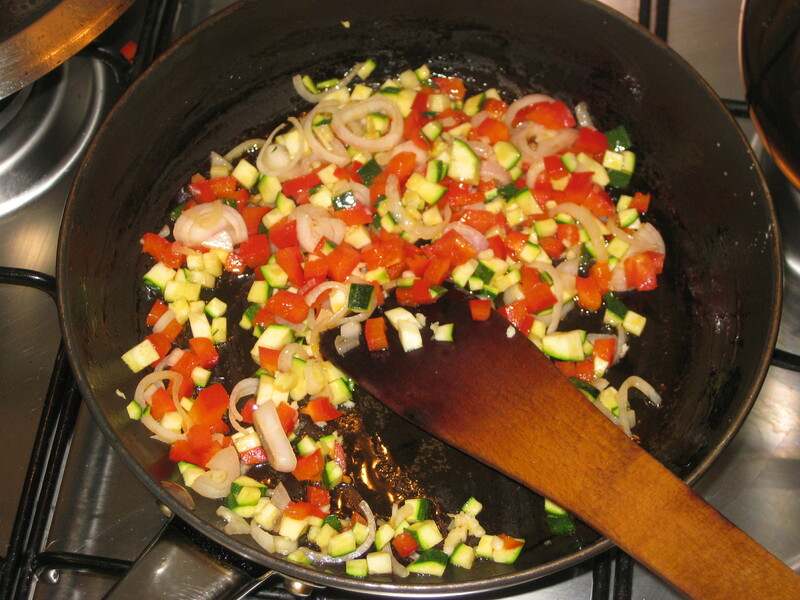 For the filling, add 2-3 tbsp oil to the pan and fry the pepper, courgette, shallots and garlic over a high heat for 3-5 minutes. 3. 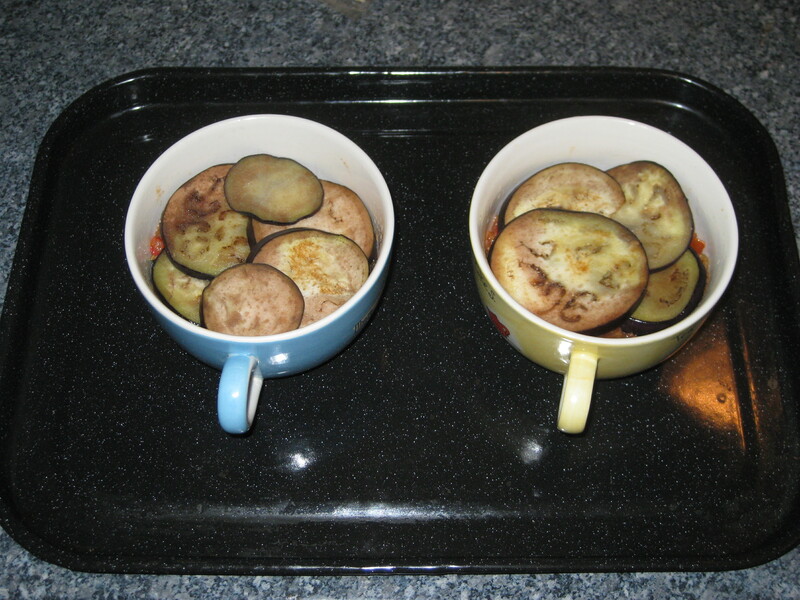 Stir in the balsamic vinegar and cook until evaporated. 4. 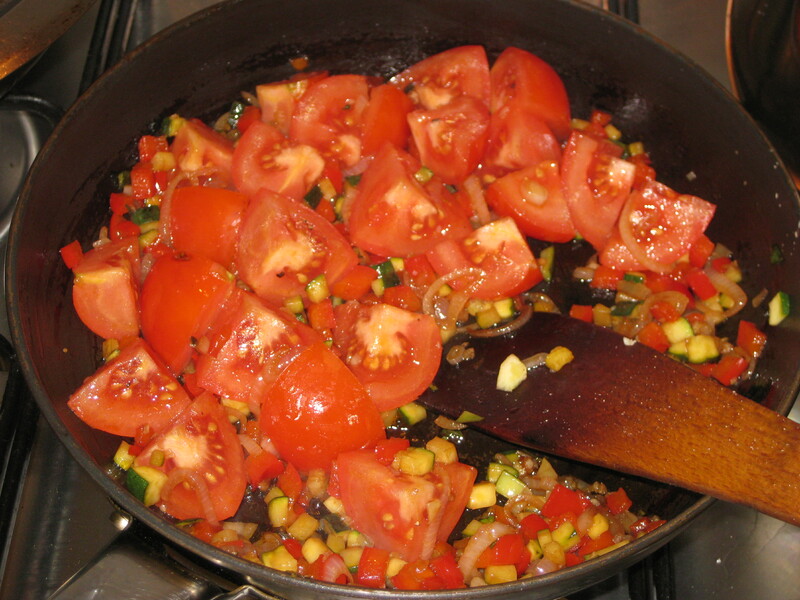 Add the tomatoes, season, and cook for 3 minutes more, stirring occasionally, until the mixture is softened but not too saucy. 5. 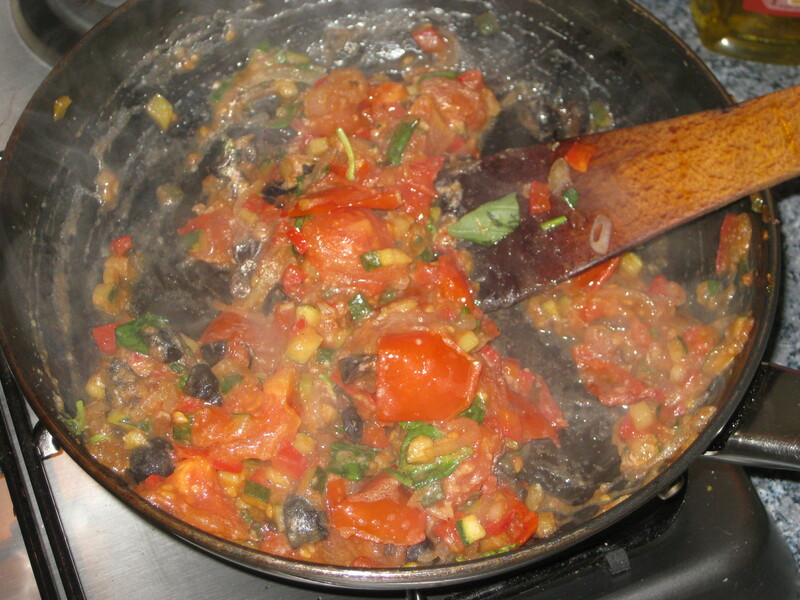 Remove from the heat and mix in the olives, capers, half the shredded basil and all the Parmesan. Set aside to cool slightly. Preheat oven to 200C. 6. 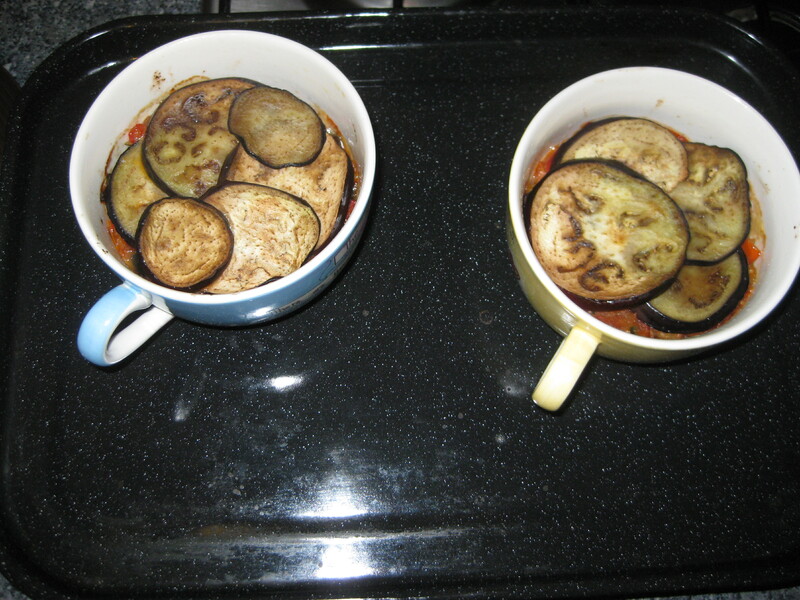 Grease 6 cappucino cups and line the bases with aubergine slices. 7. 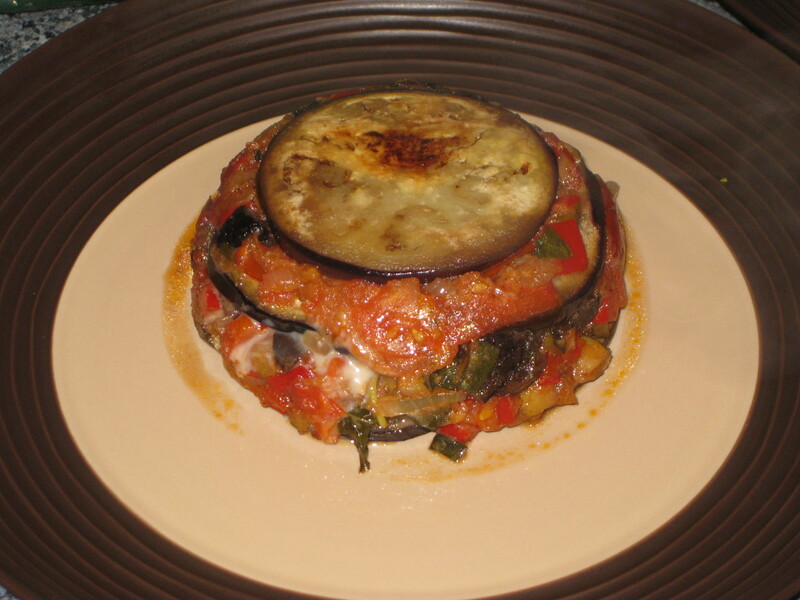 Top with the vegetable mixture, more aubergine slices, and two slices of goats’ cheese. 8. 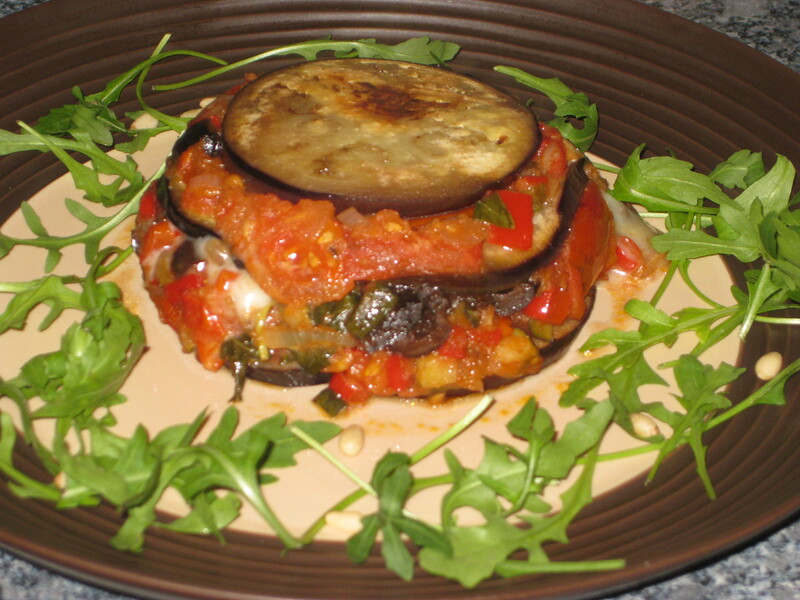 Repeat the layers one more, finishing with aubergine. Press lightly. 9. 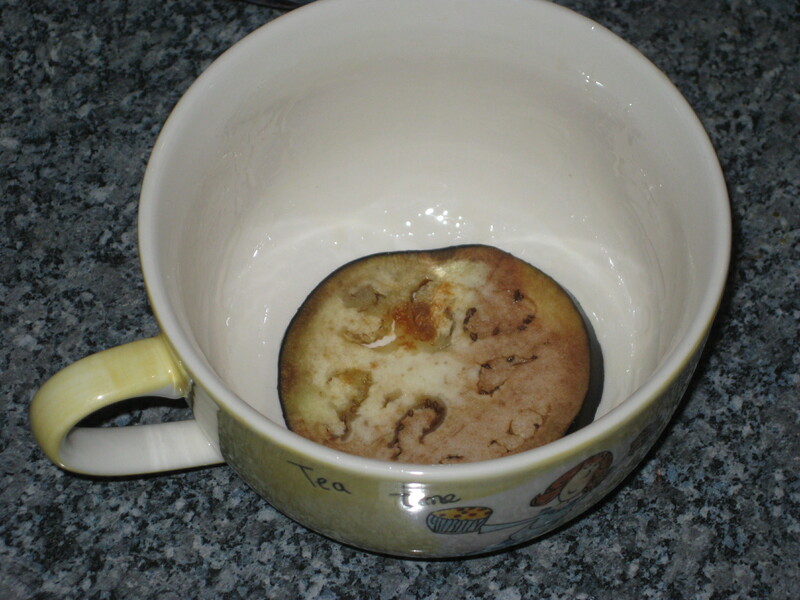 Place the cups on a baking tray and bake for 12-15 minutes, until bubbling. 11. Toss the spinach and remaining basil with the vinaigrette and seasoning, then divide between the 6 plates and scatter with pine nuts. Ta da! 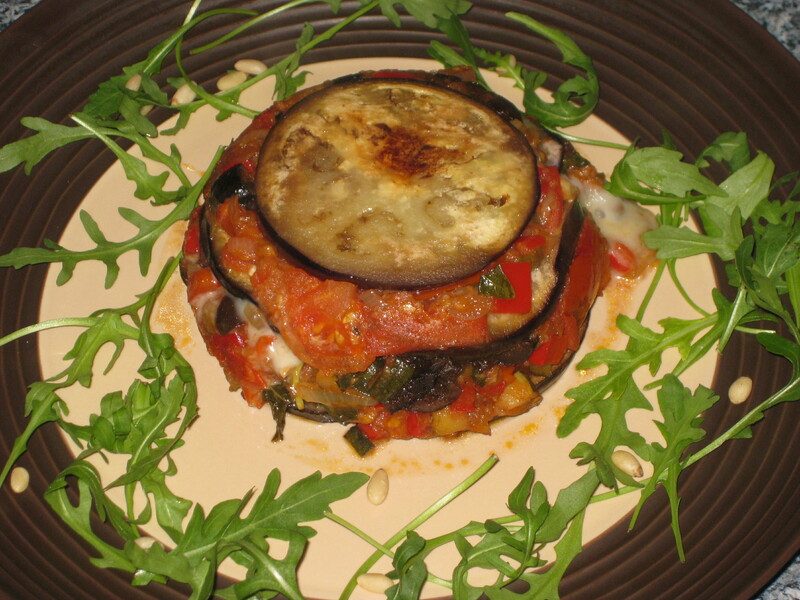 This entry was posted in Vegetarian Recipes and tagged aubergine timbales, Gordon Ramsay vegetarian, vegetarian dinner party, vegetarian main. Bookmark the permalink.